The Megger MFT1741 was awarded “Trade Tool of the Year” category at the 2018 UK Electrical Industry Awards! This is the third award that’s been given to the MFT1700 and 1701 series of instruments, and demonstrates how Megger remains at the forefront of meeting the changing needs of customers. The complex software algorithms of the Confidence Meter™ dramatically reduce variations in test results caused by electrical noise from equipment connected to the circuit, especially in industrial locations. The electrician can now see the quality of the result, not just a value. This is combined with the new no-trip loop test which counteracts additional errors created by devices such as RCDs, which are so common they can be found in electrical consumer units at home. The combination of the two methods is a market leading performance in which electricians can have far greater confidence. It also provides a unique feature in the market with the ability to test 10 mA RCD/RCBO’s protection. The award is made even more impressive, given the competition we were up against from Fluke, Metrel and Kewtech to name just a few, and also the re-categorisation of the awards so any innovative tool could be entered, not just test equipment. 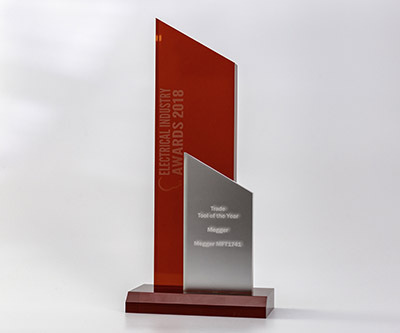 This award underlines how Megger continues to be responsive to its customers changing needs and invests in the people and technologies to innovate. Many competitors have added features that on the surface make an instrument look attractive, but what we do is innovate. The new loop test and Confidence Meter™ are a great technological leap forward in the LVI test market and our customers, along with independent leaders in the market, seem to agree.